If you offer SugarCRM solutions and associated services, Blue Mail Media’s SugarCRM Users List can expand your marketing reach in significant ways. Our Database is designed to boost your multi-channel marketing efforts up by powering you with highly reliable SugarCRM Users Mailing List accumulated from around the globe. Our email list is sure to help you unlock seamless connections with your prospects and achieve increased response rate as well as conversions. In a highly competitive age, your business needs a competitive advantage to carve out a unique place in the heavily crowded CRM market. With Blue Mail Media, you can avail our pre-packaged List of companies using SugarCRM to shore up your offline and online marketing efforts, or you can request a customized list based on your business and campaign specific demands. Our in-house team of data geeks, analysts and professionals work dedicatedly to keep our database accurate, reliable, result-oriented so that you attain visible success and achieve new milestones within and beyond the regional boundaries your organization operates in. Blue Mail Media’s marketing data gives you access to complete user information gathered meticulously from major technology markets such as North America, Europe, ASIA, Africa, APAC, Middle East and South America. 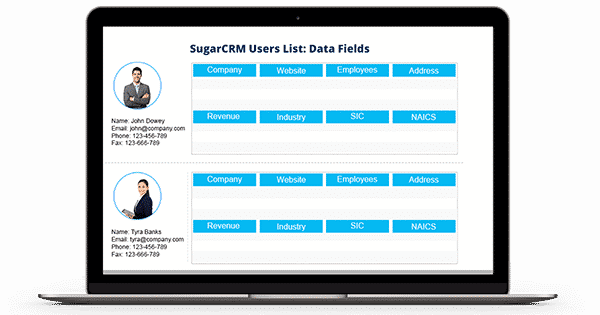 Using SugarCRM Customers List, you can reach your target audience via telephone, email or direct mail.